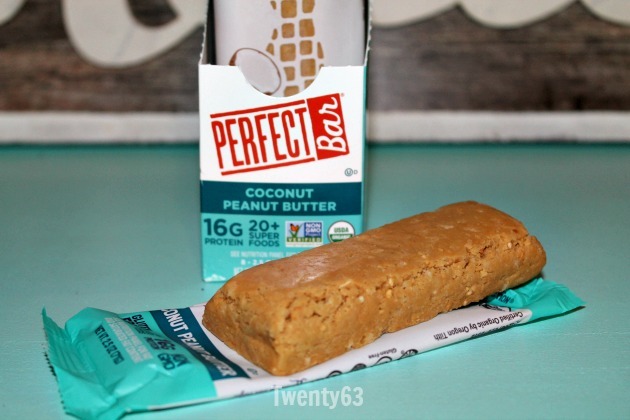 For those of you who have never heard of Perfect Bar before, they are refrigerated protein bars. But, seriously, they are more than just a protein bar. 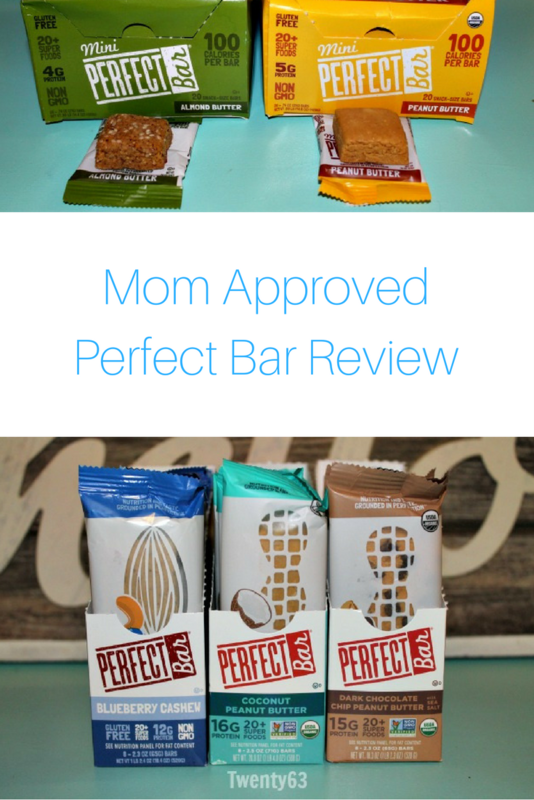 Each bar has 20+ organic super foods, made of whole food protein, gluten free, soy free, and non-gmo. Basically, hidden in this delicious bars are organic fruits, veggies and just enough sweetness to make you think you are cheating on your diet. I was impatiently waiting for my package to arrive for several weeks. When it finally arrived, I was surprised to see they sent me five boxes of full size product. I had more than enough product to share, so I started giving them to friends and family to try as well. So, the reviews below aren't solely from my perspective. 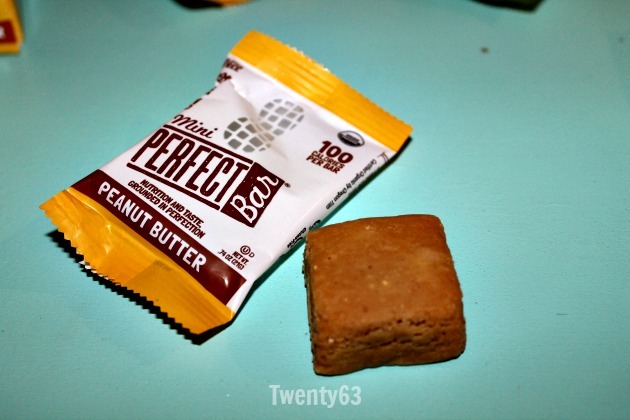 First up, we tried the Mini Perfect Bars. 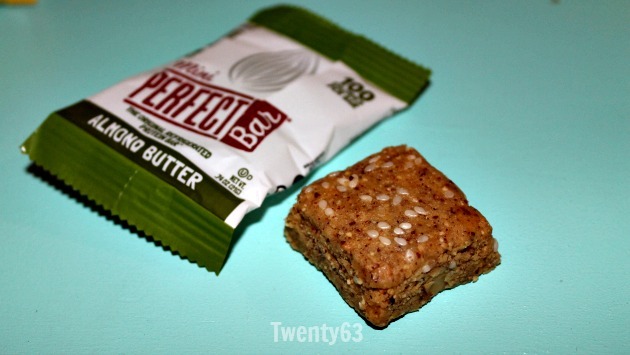 Perfect Bar makes two flavors in their mini version: almond butter and peanut butter. These are perfect for quick snacks and for kids. Our favorite one was the almond butter - it was creamy but had fabulous texture from the sesame seeds. It was perfectly nutty! And for only 100 calories, these have made it to my snack plate on a regular basis. The mini peanut butter ones weren't bad, but compared to the almond butter there was a clear winner in our house. 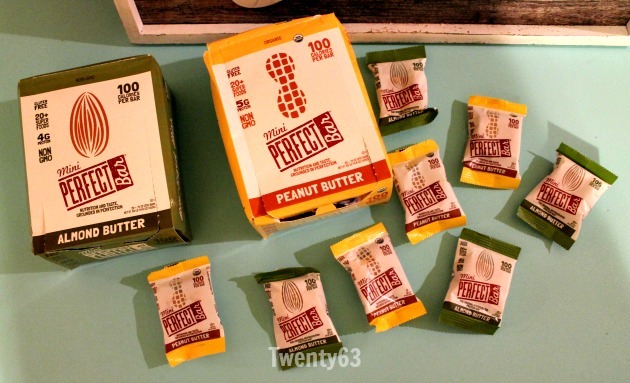 The peanut butter for some reason seemed dry, even though we think didn't any of the other Perfect Bars with peanut butter tasted dry. I really think the peanut butter was missing some texture, I bet it would have been so much better when small crushed peanuts! 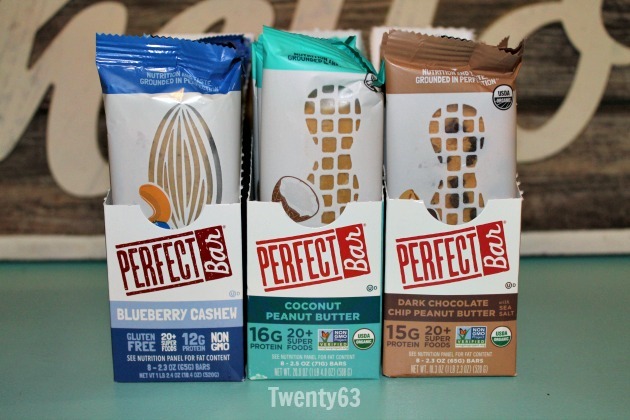 Now, aside from the Mini Perfect Bars, I also received three boxes of full size Perfect Bars: Blueberry Cashew, Coconut Peanut Butter and Dark Chocolate Chip Peanut Butter. These, I would not recommend for kids simply because of the calorie intake. For my current way of life, the full size bar would easily be a meal replacement bar. However, with the protein and whole food ingredients, it will definitely keep you full. I love some of these flavors so much, I've been known to cut a full size bar down into smaller pieces to snack on. With these three flavors, we have two easy winners and one that just didn't hit the mark for anyone. Let's start with our favorites. 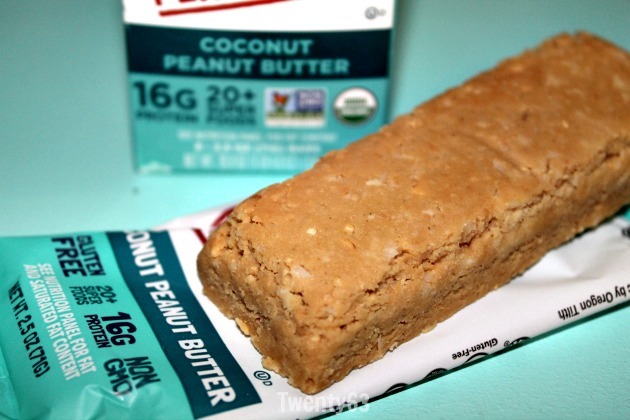 Say hello to Coconut Peanut Butter!! Ya'll this Perfect Bar is so freaking delicious! It's creamy and sweet and full of real pieces of coconut. The taste and the texture are perfect. Coming in strong with 16G of proteins and 340 calories, (hence why I would suggest the full size bars as a meal replacement) this bar is a high energy food. 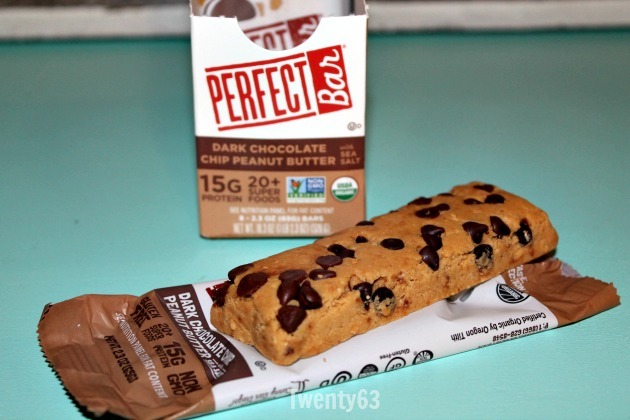 I would also like to introduce you to the Dark Chocolate Chip Peanut Butter Perfect Bar. Ahhh, just take in all those dark chocolate chips. I've microwaved a few pieces and I swear it taste just like a Reese cup. It's the perfect mix of peanut butter and chocolate, a little sweet and a little salty. Again, we all thought the texture was spot on, creamy yet a little crunchy from the cold chocolate chips. I could eat a million of these! These come in strong with 15G of protein and 320 calories. This has been one we cut up a lot because my boys have marked this their favorite, no surprise there - I mean, chocolate. 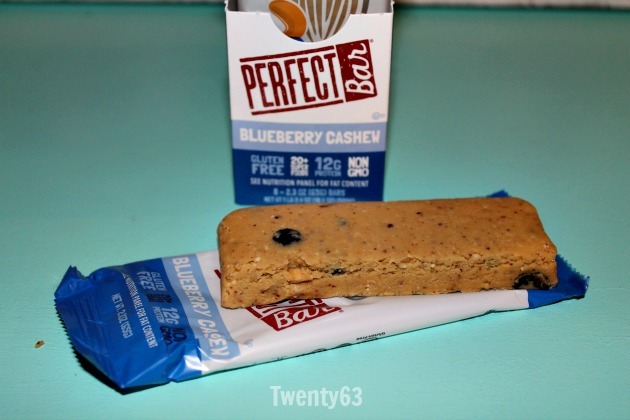 Now, an honorable mention goes to the Blueberry Cashew. This one unfortunately did not get two thumbs up in our house, nor with any of our friends or family. As you can see, it has real blueberry's throughout the bar, which provided an interesting texture. 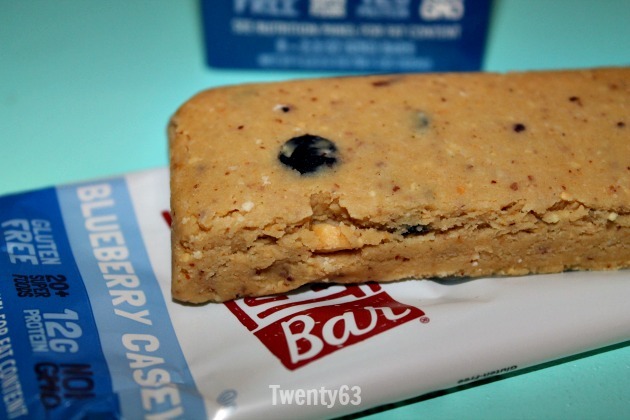 This bar is also a mix of cashew butter and almond butter, with a splash of vanilla. I'm assuming the cashew butter was a littler different for our taste buds as the taste and texture just didn't hit the mark for us. 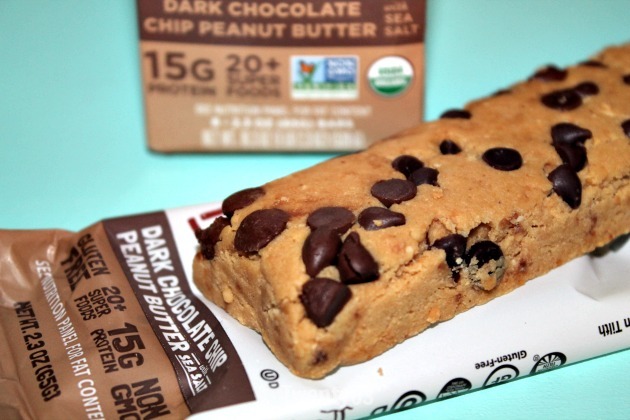 This bar packs in 12G of protein and 300 calories. Overall, the mini almond butter, as well as the coconut peanut butter and the dark chocolate chip peanut butter, have found a new home with us. We love them!! I've already bought more of the almond butter Mini Perfect Bars because the boys love them so much. What is a great on-the go snack your family enjoys?